← Why Relationships Fail? Growth! 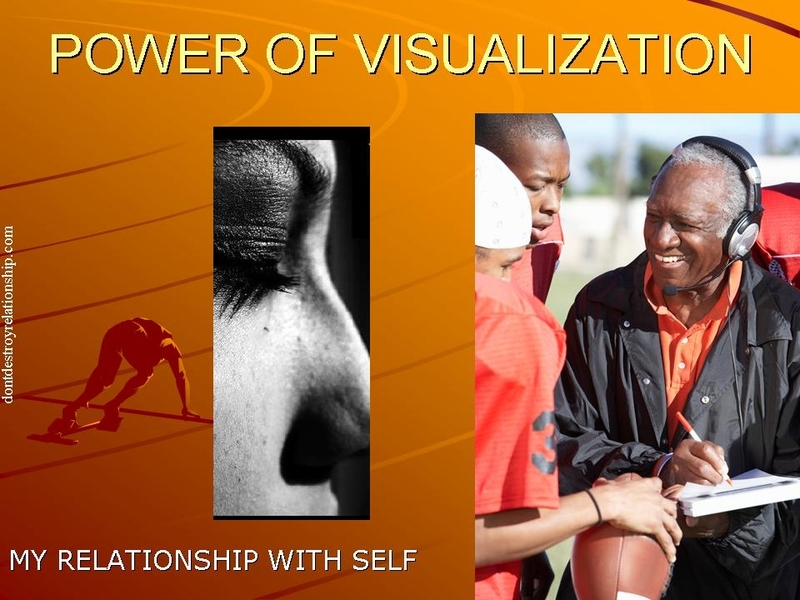 My Relationship With Self: The Power of Visualization! After the passing of my Mom and with all of the family negativity I encountered, I took time for a day of silence this past Saturday. I call it my “Silent Saturday”. I thought I always knew, but now I further know, why I do not engage in the lifestyle of negativity. It soils our spirit, our heart, plagues the mind and we are walking around with the burden of someone else’s negativity, which is not our burden to carry. My pain came from those who I allowed to enter the threshold of my heart. This forced me to self-protect and be in the position of my best defense. But before I knew it, I was a participant in the cycle of negativity by simply trying to protect myself from it. Even on the self-protection level, negativity acts as a toxin and seeps into the mind and can change your outlook. Before I knew it, I felt heavy in my mind, I was angry, the situation plagued my thoughts, and I felt unproductive. I found a way of protecting without becoming a partaker. It is called deflecting. Deflecting negativity is the best defense, because you are steering the negativity away from you, while not taking it on yourself. I had to purge, meditate, clear my mind, and dive back into the dvd called “The Secret” and re-read “Your Invisible Power”. (Genevieve Behrend) I did a stroll, alone, down Flatbush Avenue in Brooklyn. I let the summer breeze gently blow away my mind’s residue of what I remembered. Carrying bad memories of a bad situation, even for the sake of reliving the pain again and again, also creates bad energy. Bad energy brings anger, pain and resentment. I allowed my mind to let it all go. I did something a little odd, but powerful just the same. My mind recalled a movie I have in my library called, “The Little Princess”. I pulled it out and looked at it again, with a different perspective. In doing so, I could clearly see the movie’s use of “The Power of Visualization”. The young princess, after being told her father died in war, was stripped of her treasures and money, and forced to be a servant under the rule of a very bitter and hateful woman or be thrown out on the street. After having to deal with the tragedy she went into her mind and visualized whatever she wanted. She saw things, not as they actually were; which were bleak and hopeless, but she envisioned things as she wanted them to be. What she would envisioned became her reality. What she pictured in her mind, came into fruition! There is a wonderful lesson in that. The Power of Visualization is an extension, yet more powerful than the word we know as Faith. Faith is defined in the bible scripture as “…The substance of things hoped for, the evidence of things not seen“. (Hebrews 11:1) Visualization takes faith and strengthens its power from hope to belief, then to an affirmative “know” to the point that you are envisioning what you want as evidence in the now— right now. You then begin to live as though it is now. Then the Laws of Attraction becomes more powerful and sends everything you are thinking, seeing, and attracting back to you. Ever heard of the saying, “The rich gets richer and the poor gets poorer”? This is because we continue the cycle of our lives based on what we see in our situation right now. We reinforce our bad (if you will) by seeing the reality of now. You see it, you live it and you actually attract it. If we live a life of negativity, we cannot execute the powers we control, because we are too weak by the forces of negativity to use any power we have at our disposal— like faith, hope, love, forgiveness, kindness, goodness, and mercy. If we have dominion over our minds, above the negativity that surrounds us, we become stronger to do, see, or obtain anything we want. I shed off the burden I picked up trying to fix situations I did not break. I removed the burden by lovingly letting go of those who wanted to emotionally dump on me. No. Those days are long gone now. I let it all go. And more importantly, I am living in the Power of Visualization. There is no room for the negative pain and negative mourning of others. I am sorry. I have been instructed to live. That is why I have been left behind and that is why my time is not quite yet! I am back in balance again with a little more self power! This entry was posted in Self and tagged deflect rather than self protect, power of visualization, Relationship with self, removing negativity. Bookmark the permalink. 3 Responses to My Relationship With Self: The Power of Visualization! I really like this. Putting the power back into your life and not letting others continue to bring you or me into their misery. I say, stay strong in the memory(visualization) of love. Thanks for the reaffirmation. If that’s a word. Hello Natalie, How wonderful was this. This was great. You are on such a wonderful path and you can’t afford to let anything like negativity get in the way. Thank you for reminding me not to feed into those thoughts that create limits.